Kristine Hill's Garden Shed is built in 1:12 scale and housed in several volumes of a garden encyclopedia. Photo copyright 2010 Lesley Shepherd, Licensed to About.com Inc. When the container is a strong statement, like this set of gardening books used by Kristine Hill, you need to make sure something pulls the viewer's eye into the interior. Framing and strong outlines on the windows and doors work. The birdhouses on the exterior are echoed by a similar shape that pulls the eye into the view through the window. The exterior gives clues as to what is inside, but the viewer must become engaged, bend down and peep in, to see the collection on display. What Pulls Your Eye Into a Detailed Flower Shop Scene? 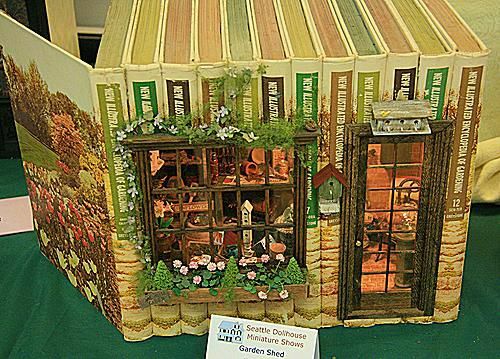 The view through the scale window and doors into the 1:12 scale "Garden Shed" built into books from a garden encyclopedia by Kristine Hill. Photo copyright 2010 Lesley Shepherd, Licensed to About.com Inc.
Not all miniature displays are massive dollhouses. Practise with small views will help. This delightfully cluttered space is given some order by the lines of the narrow birdhouse, which stand out from the other contents and relates to the lines of the book spines on the outside of the shop. Once you see the obvious birdhouse, your eye goes to the next one, up on the wall at the edge of the window. Other views draw your eye to the scene by the door to the position of the lighting and the reflective surface of the gazing ball. With limited views through windows and walls, the back of this small space has been used to great advantage, with furniture pieces, and wall displays that showcase a varied collection naturally. The front and interior of this flower shop are displayed on a turntable. Photo copyright 2009 Lesley Shepherd, Licensed to About.com Inc. When you want to show off both an exterior and an interior, sometimes a carefully connected vignette is the best way. The back of this wall shows enough elements of a flower shop to successfully house a varied display of plants. Once piece of furniture has been set to work for both sides of the view, while the walls are carefully set up with decorative brackets and shelves. This narrow display shows how few pieces of furniture you need to effectively display a collection of miniature plants. The display is set on a turntable to allow easy views of all items. The Oasis Flower Shop roombox by Annie Herzfeld, exhibited at the Fall 2009 Seattle Dollhouse Miniature Show. Photo copyright 2009 Lesley Shepherd, Licensed to About.com Inc. Staged for height, the display shelves in this flower shop draw the eye into the background of the display. The carefully stacked corner displays frame the back wall, but with one outer and one inner corner display, they offer a pleasing asymmetric balance, repeated in the curve of the front display unit. Here the main display is of pottery and baskets. The use of indoor plants and a few other pieces turns it from being a pottery collection, into a well stocked flower shop interior. Notice how the back wall display is set on one of the featured design curves to set it off. This roombox by Annie Herzfeld is one of the Roomboxes from the Fall 2009 Seattle Dollhouse Miniature Show. A miniature flower shop vignette in a windowbox shop by Betty Bonney. Exhibited at the Fall 2009 Seattle Dollhouse Miniature show. Photo copyright 2009 Lesley Shepherd, Licensed to About.com Inc.
Great Display for A Small Focussed Plant Collection - A Classic Windowbox Vignette. This classic windowbox vignette is a simple box behind a framework. The workspace is featured opposite and below the window, with just enough of a glimpse of an open drawer to imply someone has left their arranging station to head out the door and around the back. All the elements of a flower shop are here, with an easy view into the interior and ample exterior and window ledge space to showcase featured items where there is ample daylight. Notice how once again, the display space is tiered, going from the flowers at the front, to the window ledge with the cat, to the working counter and then up to the wall shelves. The views into the interior aren't limited by the frontage, but framed. These types of traditional windowboxes are often made from simple materials, foamcore for the box, and thick card (illustration board, bookboard) for the frontage. Interior shot of a 1:12 dollhouse scale flower shop exhibited by Leslie Nelson at the Spring 2009 Seattle Dollhouse Show. Photo copyright 2009 Lesley Shepherd, Licensed to About.com Inc. This miniature flower shop is set into a small open backed one room house with a lean to shed. The main floral display is located in the main room, and clever positioning of similar tables allows for a range of plants and garden related items to be on display. The lean to has been used for a potting bench and working setting. As this is in a small one room cottage, there is room on the sides and front for exterior landscaping, as well as signs, windowboxes and other floral displays. A Florist Shop Roombox by Judy Lauson exhibited at the 2008 West Coast Dolls House Show. Photo ©2008 Lesley Shepherd, Licensed to About.com Inc. Double windows flanking the door allow for an easy view into a collection of floral arrangements in this simple shop design. The varied shapes of the floral arrangements show up well framed in the deep window bays. The interior of the shop is more of an afterthought to fill in the story, with the main focus left on the windows and shelves. Le Jardin shop window front by Janey Elliot exhibited at the spring 2010 Seattle Dollhouse Miniature Show. Photo copyright 2010 Lesley Shepherd, Licensed to About.com Inc.
Windowbox scene of the exterior entrance and window into a flower shop, exhibited by Cindy Diamond at the Fall 2010 Seattle Dollhouse Miniature Show. Photo copyright 2010 Lesley Shepherd, Licensed to About.com Inc. This vignette features the outside scene plus a backdrop window to showcase a flower shop. The angled door takes up little space but allows room for wreaths or other florals, while the window and wall frame the view of whatever you collect at the entrance. This is another great way to start a small florist's shop display, but you do need lights for the most impact as the scene can be a bit dark. Without the angle on the door, the box would be far less interesting. With a window in the door you could showcase a few items behind the door. A bakery and cafe exterior vignette exhibited at the Spring 2010 Small Endeavors Miniature Show. Photo copyright 2010 Lesley Shepherd, Licensed to About.com Inc. This shop doesn't showcase flowers, but it is a great example of using a narrow shop back with a sidewalk to extend a miniature display. Careful use of both indoor and outdoor space can extend the range of goods on display, or allow an easy view of part of the miniature storyline. The outdoors and inside don't have to be treated the same way, the outdoors could show a scene of devastation as dogs chase a cat through a range of plants, or you could have a flower cart, or outdoor furniture featured on the pavement. Other similar shops with large sidewalks or patios are shown in the Spring 2011 Miniature Roombox Gallery From the Seattle Dollhouse Show.